Reg Standards Bureau Our thanks today are due to Michelle O'Sullivan, late of this parish, who snapped a wonderful poster boasting to residents of the LINQ Hotel in Las Vegas of its recycling prowess. Guests are informed that" "Every year, The LINQ Hotel recycles the equivalent weight of 600 great white sharks," which the incautious might misread as meaning that the establishment produces 480,000kg of recycled waste on an annual basis. TRIGGER WARNING: Contentious citation of Newtonian physics ahead! This is not what LINQ is claiming, however. 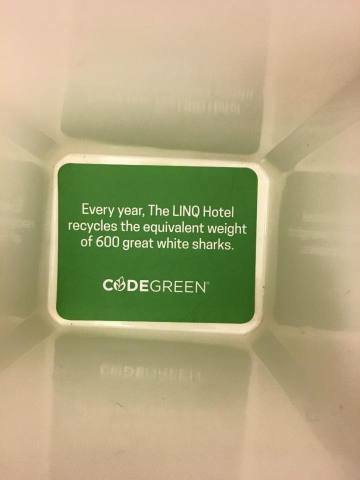 The hotel has defied the laws of motion to recycle the weight itself equivalent to 600 great white sharks; that is, LINQ has managed to recycle the force with which objects move as a product of their mass and acceleration due to gravity. We can't even grok how absolutely revolutionary this is, but we know it's very big. Yuge, in fact. Someone should tell the new president. Despite not knowing what it even means to recycle weight, we shall henceforth consider the standard unit of recycled force when that force is recycled as the great white shark (Gws) where 600Gws is known as a LINQ (Lnq). Further thanks are due to John E Dunn (not to be confused with John Donne) who spotted a wonderful measurement in a Planet Confidential article about The Big Summer Read In Durham, the Lindisfarne Gospels. The gospels, as readers will know, are an illuminated manuscript produced in roughly 715AD in the monastery of the Holy Island of Lindisfarne. As Planet Confidential explains: "The skins of 128 calves were used to make the Lindisfarne Gospels and the bound book weighs 8.7kg or as much as an adult badger." The Lindisfarne Gospels (LGs) are as such equal to the Badger (Bgr), which is equal to 2.0714Jbs, the Jub (Jb) representing the weight required to crush an Australian beer can at sea level, ie 4.2kg or 0.08267 UK short hundredweight, 7 Japanese kinn or 984.6 old Russian zolotniks. Reg Standards Bureau How much can you find down the back of your sofa? A non-Standards Soviet approved measure of weight? Sod off, BBC! How many Routemaster bus seats would it take to fill Wembley Stadium? Reg Standards Bureau Well knock us off our unicycles, we had no idea!